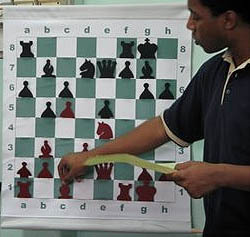 IM Robert Gwaze of Zimbabwe has been based in Singapore the past year and recently set foot on Malaysian soil to deliver a lecture at the MSSMKL (MSSM Kuala Lumpur) chess camp, November 20-23rd, 2006. The camp is part of a growing initiative in Asia to spread chess throughout the region and Malaysia is following the footsteps of regional giants China and India is this regard. Ching Kim Lye reported from Malaysia that the camp was divided into two parts, intermediate and advanced. Gwaze gave the training session to group of advanced chess players while Joseph Toh led the intermediate students. Top three scorers in the MSSMKL tournament won free admission to the camp. See full report at MSSMKL blog… here! IM Robert Gwaze pictured with Malaysian beginning students (left) and the advanced students (on right).